Levolor Classic Value Visions faux wood blinds combine the natural look and warmth of real wood with durability ease of cleaning and humidity resistance, but at a fraction of the cost. This Classic Value product comes with a standard 2.5" Classic Valance only. Upgrade valances are not available with this product. Caution due to 12-15-18 federal safe cord act, multiple cords will be attached to this blind with lightmaster options. 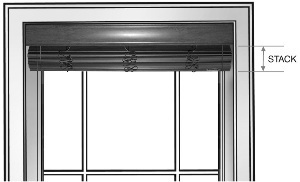 A no rout hole design blocks light and prevents outside 'see through'. Available in Premium Real Wood Blinds, NuWood™, and Visions™. Provides the flexibility of raising one blind while keeping the other lowered on extra wide windows or patio doors. Two or three blinds on one headrail are available up to a total maximum width of 144". Minimum innerspace is 1/2" between blinds. Horizontal slat alignment not guaranteed. Available in 2" and 2 1/2"
Put the control in your hands with our optional wand tilt. Not available on 2 1/2" Premium Real Wood Blinds. Tilt and Lift Controls-Opposite Side 10-1/4" 96-1/2" 10" 96"
Tilt Control in Center-No Lift Control 9-1/2" 10-1/4" 9-1/4" 10"
No Tilt and Lift Controls; Slats in Open Position 6-7/8" 9-1/2" 6-5/8" 9-1/4"
1" Slats 7-3/4" 8-1/2" 9-1/2" 10-1/2" 11-1/4" 12-1/2" 13" 15" 17" 18-1/2" 20-1/4"
2" Slats 6" 6-1/4" 7" 8" 9" 9-1/4" 9-1/2" 10-1/2" 12-1/2" 13-1/2" 15"
2 1/2" Slats 5-1/4" 5-3/4" 6-1/4" 6-3/4" 7-1/4" 7-3/4" 8-1/4" 9-1/4" 10-1/4" 11-1/4" 12-1/4"
Stacking dimensions are approximate and could vary +/- 1".